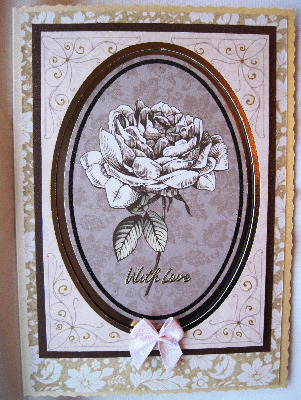 Handmade greetings card with sepia rose in raised frame, ideal for a special lady. Ideal choice for a special lady, this cream deckle-edged handmade card has muted gold floral background with line illustration of single rose in oval raised frame in sepia tones trimmed with pale pink bow. 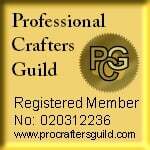 'With Love' wording ingold can be changed to your requirements. Please choose wording for the printed insert from the list below.